Automatically Shutdown, Hibernate, Suspend, Restart, Log Off or Lock your computer so it doesn't have to be on any longer than necessary. This prolongs its lifespan and saves power. 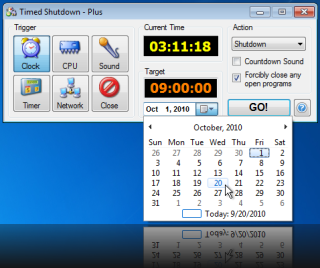 The triggers include Time and Date, CPU or Network usage, on Application Close and even Sound Level. The program hides in the system tray when running so can be easily monitored and aborted if needed, and uses a final countdown to eliminate unexpected shutdowns. You can also run the program with a command line for use at the end of a batch file, or from a shortcut with predefined settings.